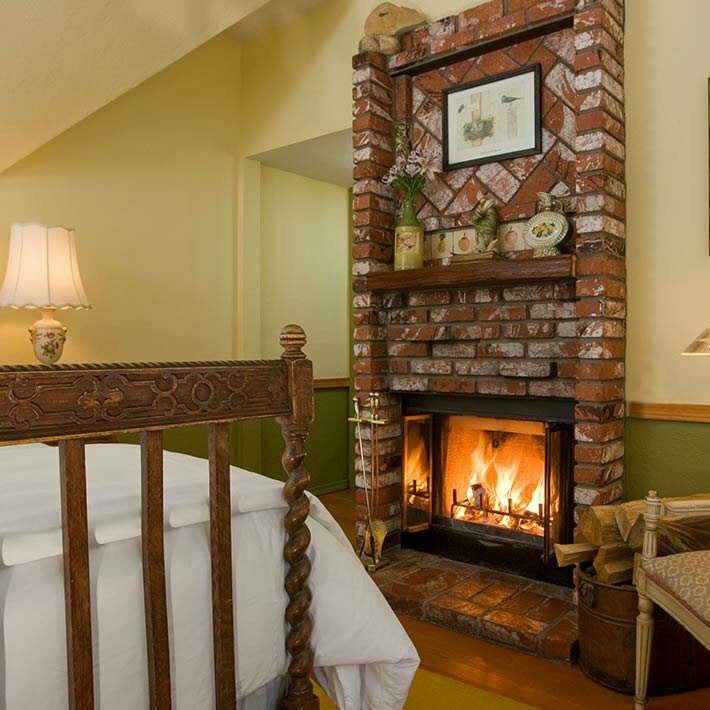 Each of the seven guest rooms of our bed and breakfast in Big Bear is individually decorated with antiques and vintage touches or handcrafted log furniture. All have a private bath, queen size bed with luxurious linens and down comforters, and fireplaces, six out of the seven are wood-burning. Cozy robes, towel warmers and homemade milk bath add to your comfort. All room prices include a full, gourmet breakfast. A complimentary guest kitchen features hot and cold beverages, our signature hot chocolate chip oatmeal cookies and microwave popcorn. If you need to stay in touch with the outside world the entire Inn is wireless with high speed internet. Go ahead and indulge yourself! Our Presidential Suite is for those who desire the best of everything but appreciate the classic atmosphere and rustic elegance of Southern California’s mountains. A spectacular river rock fireplace is the focus of the suite – embedded with 20 million year old fossils and artifacts from Big Bear’s mining days. 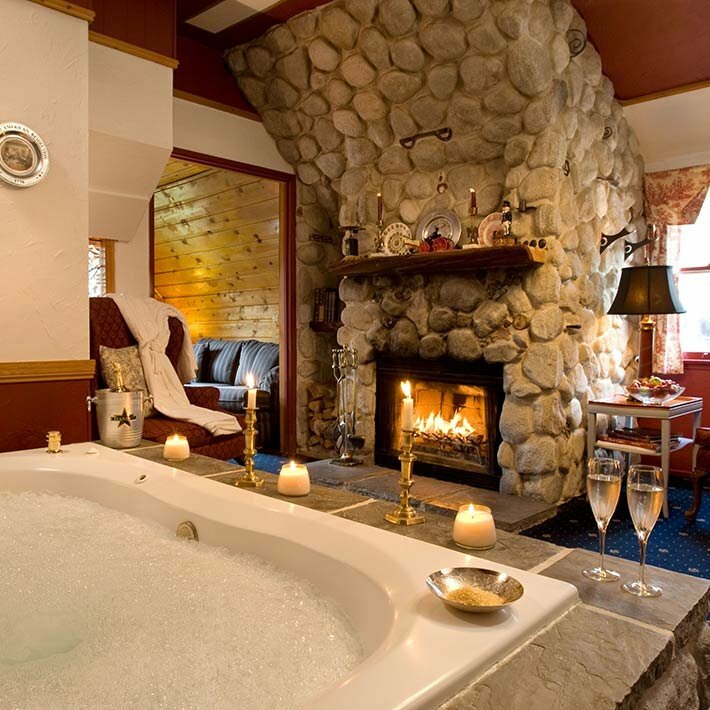 Soak in a two-person Jacuzzi and feel the pull between staring into the fire’s dancing flames or your loved ones eyes. 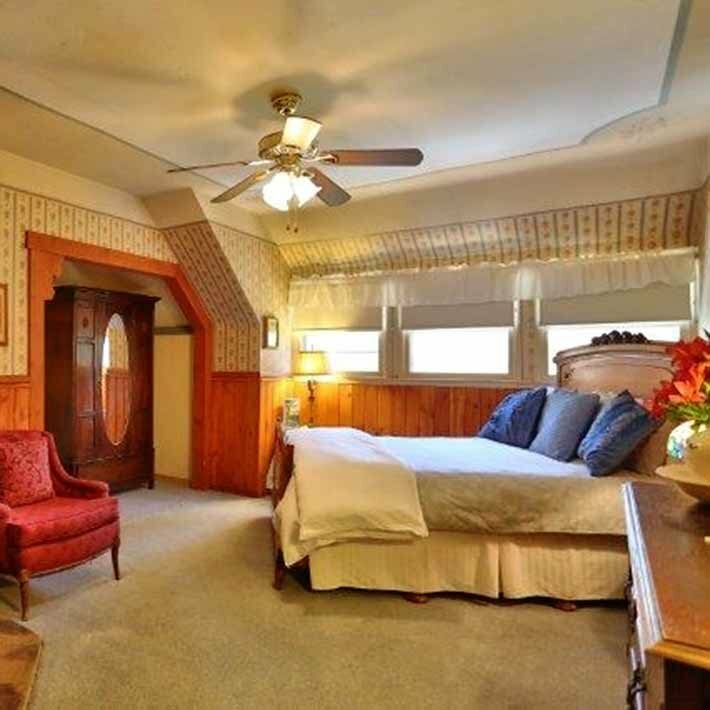 Retire to the suite’s massive grand four-poster queen sized pine bed, made cozy by tongue and groove walls and ceiling and within view of the fireplace. One of Big Bear’s most famous outdoorsmen, Ted Ducey visited the Valley on his honeymoon in 1916 and never left. Ducey’s tales of his pet bald eagle and tame wildcat have been printed and broadcast throughout the country. What once was the Mansion’s historic carriage and tack room is now a secluded and spacious 600 square foot, three-room suite featuring wraparound windows and a big Jacuzzi for two accented by Mission tiles and large timbers positioned to view the flames in the wood-burning stove. 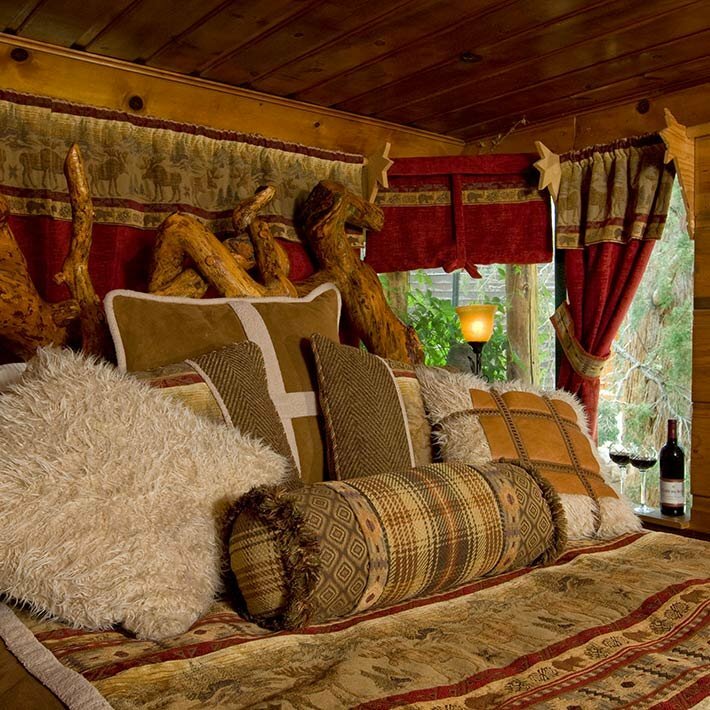 Relax surrounded in rich earthen tones and aged knotty pine accents. Rest easy in the Suite’s willow furniture, its artisan log-framed bed – singularly unique in character and charm – and private veranda. All perfectly suited to enjoy the suite’s cultural decorations – Native American collectibles and original artwork by Valley photographers. 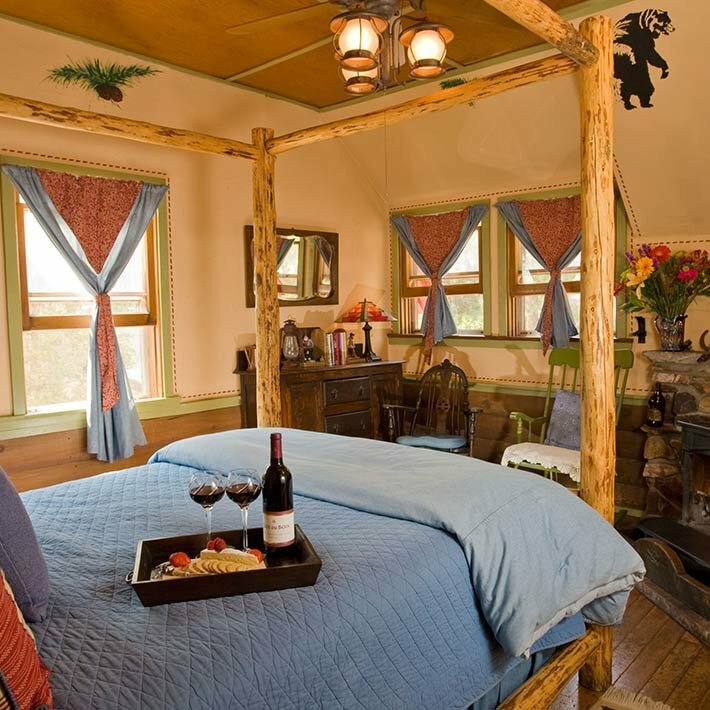 The Ted Ducey suite is the perfect space for the discriminating and romantic couple who treasure their privacy as much as they appreciate rustic elegance. But we have to warn you – you may be inclined to stay on indefinitely just as Ted Ducey did. 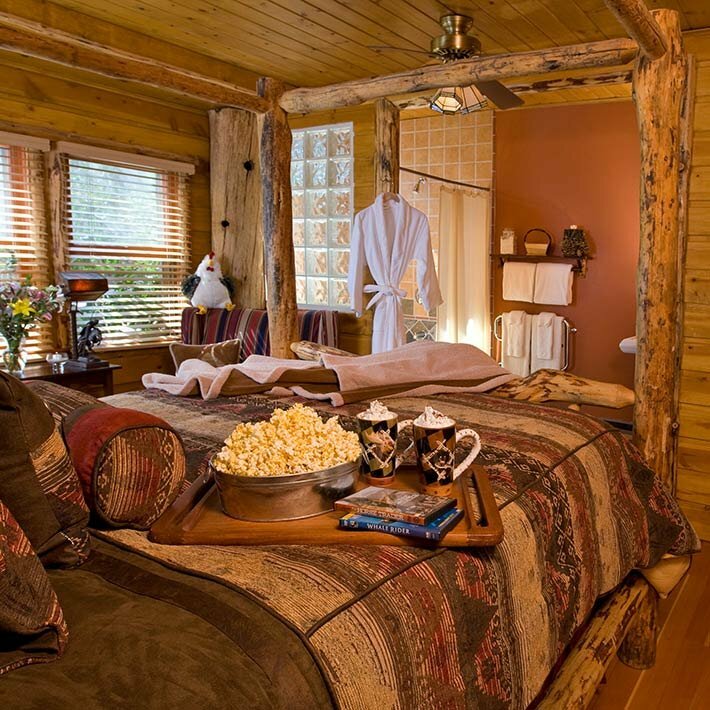 Our newest suite, the Cozy Pine Suite introduces you to the rustic sophistication of the high country. A massive lodge pole pine canopy queen sized bed dressed in luxurious 400-thread count linens and a micro-suede down comforter invite you to reacquaint yourself with noon-time snoozes. Leave the world outside your door as you spoil yourselves in a Jacuzzi tub and shower big enough for two, while the gas fireplace warms your room to perfection. English antiques, vintage Native American light fixtures, warm cinnamon hues and timber accents mingle with the mountain style of yesteryear. Alexander Barret built the Manor for his lovely wife Bessie, and this deluxe room is dedicated to Bessie’s delight in the natural beauty of the forest. This bright and airy room floods with sunlight every morning and is a favorite of many guests. Bessie’s Room is inviting with it’s shabby chic antique white wicker furniture, Yves DeLorme linens from Paris, and a stained glass window in the large brick fireplace are nicely joined by ample views of the garden from a comfortable and elevated Queen Size brass bed accessed by step stools. This room is a favorite of our returning guests mostly because they enjoy lounging in bed and watching the reflection of the flames as they dance across the ceiling. In the 1930’s Clark Gable honeymooned at the Manor with his beautiful new wife Carol Lombard. Legend has it that the amorous couple stocked the room with firewood, lit a fire in the Franklin stove and didn’t leave until it was time to return to Hollywood to the set of Gone with the Wind. If only -that stove could talk – what tales it would tell! Cuddle up in the antique French walnut Queen Size bed beneath stenciled ceilings and bask in the romantic warmth from that same Franklin stove. Enjoy a separate private bath with an old-fashioned claw foot tub and shower combination; use our plush terrycloth robes to dash across the hall. Quaint and charming, this gabled room with blonde pine floors was Bessie’s favorite. In the Bouquet Room, her love for flowers and birds is celebrated with Yves DeLorme linens from Paris, as well as artwork and whimsical details like a vintage birdhouse. 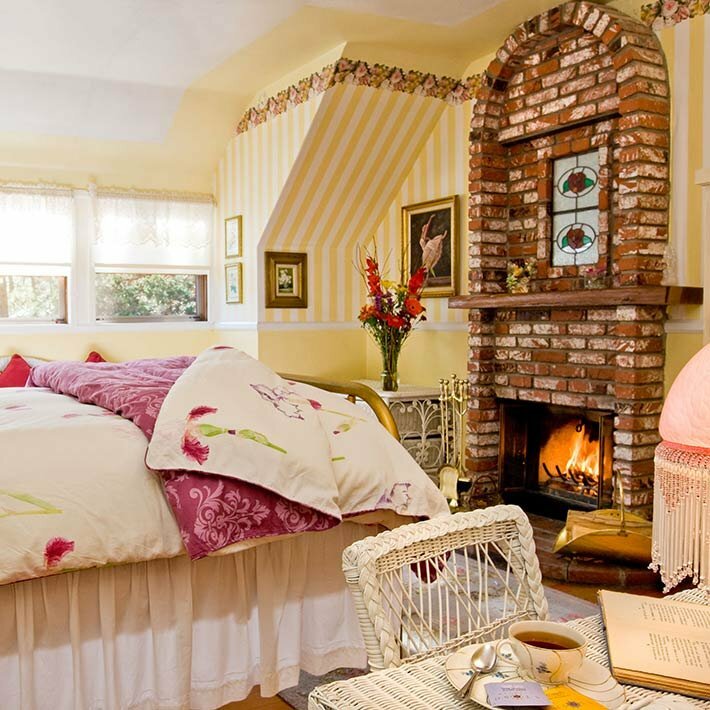 The brick fireplace continues the theme with hand-painted ceramic tiles and the queen-size antique bed is made of turn-of-the-century twisted cane oak. Spend some time lounging in bed watching the resident squirrels and birds at play outside your window. The private bath features a claw foot tub and shower combination and an antique pedestal sink.